Unlike a pricey nutritional supplement that your body might not properly absorb, the nutrients in bone broth are incredibly easy for your body to digest and assimilate. This is all thanks to the natural extraction process that happens during the long simmer time. This chicken bone broth is made with collagen-rich chicken feet and bones, and slow simmered with organic herbs and vegetables for over 10 hours. 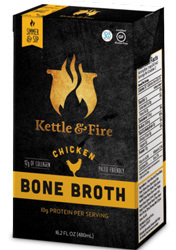 Kettle & Fire’s Chicken Bone Broth offers a unique combination of amino acids, vitamins, minerals, and compounds. Ingredients: Chicken bone broth (filtered water, organic chicken bones, organic apple cider vinegar), chicken broth, organic celery, organic roasted Poblano pepper, organic green pepper, organic onion, organic carrots, organic garlic, organic scallions, organic tomato puree, organic herbs (parsley, thyme, rosemary, basil), organic spices, sea salt.